The so called Yamuna River Front Project, termed as the dream project of the U.P. Chief Minister, will bring an end to the iconic heritage Keshi Ghat and the other ghats adjoining to it. 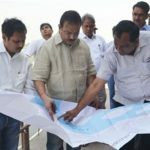 It seems the project is heading to the same direction of the infamous Taj Corridor Development Project of 2003 that brought down the Mayavati Government. 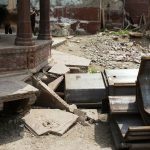 Sadly, restoring the ancient architectural Ghats of Vrindavan appeared to be the last thing on the authorities’ mind when they allowed the said project to be executed on the Ghats which are known for its pristine beauty. They may actually end up scripting its epitaph, because experts fear that the mining being done for building the new embankment could weaken the very foundation of the ancient ghats, including Keshi Ghat. Moreover, the building of the new ghats, will push the river further from the iconic heritage ghats, and thus obstructing the natural flow of Yamuna. 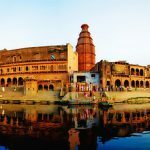 Keshi Ghat, in addition to Pandawala Ghat, Kishori Rani Ghat, Cheer Ghat and Bhramar Ghats in Vrindavan are all ancient structures which hold immense religious, historical and architectural significance since these represent the point where the holy river Yamuna touched the city of Vrindavan. Among these, the Keshi Ghat, Pandawala Ghat and Kishori Rani Ghat was the only set of ghats which touched by river Yamuna in recent times. Since none of the ghats are community owned, there are chances that when the new ghats begin functioning, the public access will obstructed to the old ones. It is important to note that instead of restoring the area to its pristine form, the authorities doing further construction beyond the paved road made over the illegal dumping on the river bed. The said beautification project involves reclamation of land beyond the ghat to create space for a new ghat further ahead into the floodplain and river banks, thereby obstructing the natural flow of Yamuna River drastically. 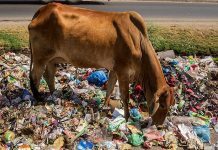 In fact, since the entire area before Keshi Ghat has illegally become a built up area, Keshi Ghat became an eyesore for many who want the illegal ring road of Vrindavan should continue from in front of the Keshi Ghat so that the real estate value goes up. An interceptor pipeline parallel to the Yamuna river carrying sewage is also being laid along the Ghats i.e in between Ghats and the River Yamuna, falling in the floodplain. This interceptor pipeline is planned to run parallel to the proposed renovated ghats of the Yamuna. This huge pipe line is being laid on Yamuna to facilitate the Kosi Nullah, which comes from the town of Kosi, 35 km upstream and falls in Yamuna at Bihar Ghat. It would have been practical and more sensible if the sewer of the Kosi nullah was treated in upstream at Sunrakh or any other village, by building an STP. The treated water could have been utilized in the fields there. The government has not provided any kind of details as to whether there would be a sewage treatment plant (STP) for the interceptor pipe line. On inquiring further, it was found that the fund for the STP will be released in the second phase, which is not inclusive in this project. By then the election will be declared, and the execution of the project may be withhold. The half finished project will look worse than the present condition. There is a history behind the entire sewer treatment situation of Vrindavan. Several Sewer Treatment Plants were built in the town to treat the sewerage generated in Vrindavan. But none of them ever functioned properly. 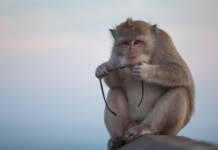 There was a big problem in the planning of project every time. The government doesn’t bother to organize a public hearing before initiating any concept of development. The whole city was dug to lay the network of the sewer pipes in 2010, but most of them never worked. The drains of Vrindavan were built in British time, which used to flow downhill of the town towards the river. When the STPs were established in of the late nineties, it were built uphill the town. 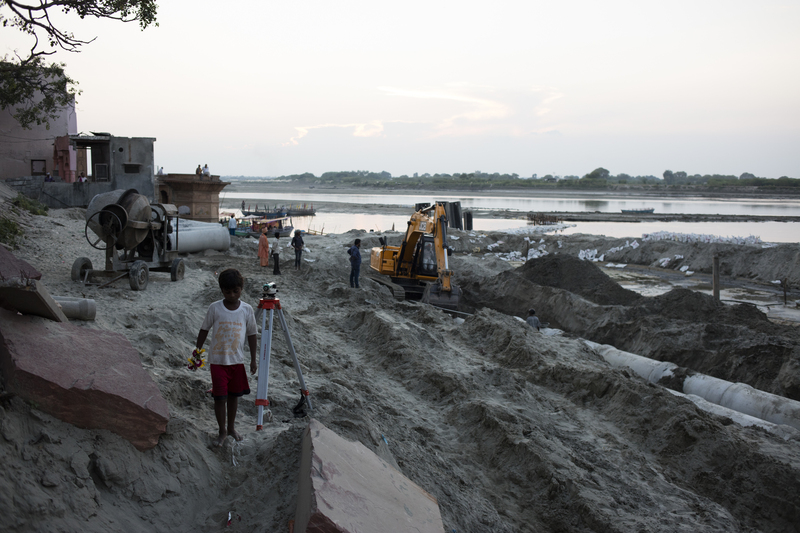 Several Pumping stations were built on the Yamuna bank, which pumped the sewer to the STPs five kilometers uphill. The STPs needed power supply to send the sewer to its treatment plant. It worked well in the first few months, but never worked properly after that. When there was power-cut, it used to be run by the generators, which needed diesel as fuel. But the fund allotted for buying the fuel has always been misused. The STP’s should have been built across the river in the first place, by taking the sewer pipelines across the river on a small bridge. It would have saved money and energy to send sewer to the STPs, as sending the sewer to the downhill was easier. 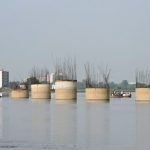 With the change of each government the real estate mafias, who are hands in gloves with the government officials suggest such disastrous projects on the Yamuna Bank, which could push the river further, so that they can develop new colonies on the flood plain. 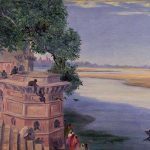 Vrindavan has lost most of the ghats and almost entire flood plain due to the greed of the people, who wanted to earn money dealing in real estate. Another such dream project of the Chief Minister came in 2010, when the then Chief Minister Mayavati announced a slew of developmental projects for Vrindavan amounting to more than Rupees Three Hundred Crore. The project caused irreparable damage to the ecology and heritage of Vrindavan. Hundreds of the heritage old trees were cut in the name of the road broadening. Big drains were built damaging the steps of the old ghats. 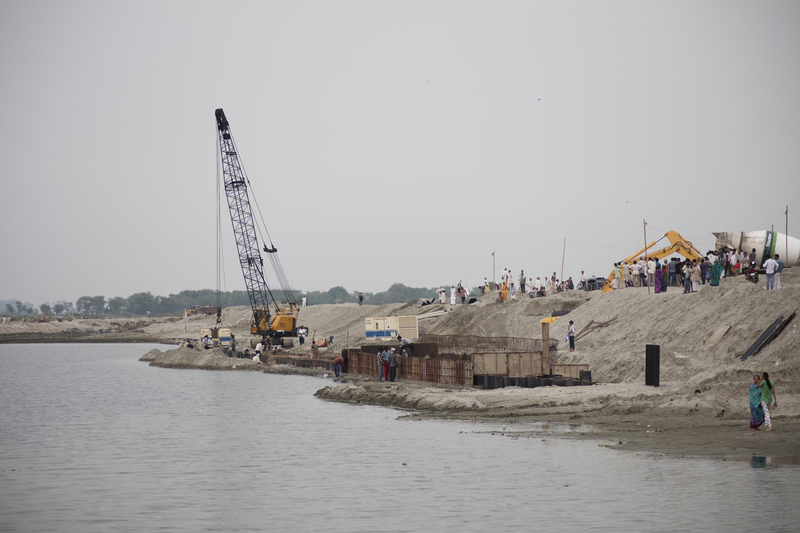 The controversial project of building the half circular bridge was part of that dream project, which was challenged by the Vrindavan Activists. 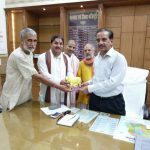 The hectic activity from May 2016 to now, in the vicinity of the panoramic ghats of Vrindavan, is in fact the ground work for the Rs. 218 crore projects that proposed to give a facelift of the Yamuna. While the state government tailored this plan to its needs, the Union Government has also turned a blind eye to the maneuverings. It has come to the light that the project had got underway without any of the mandatory clearances. Furthermore, the work was violation of several stipulations such as those imposed by several courts of the country. As the dust settles, it is quite evident that not only the cultural and heritage issues are cast aside to pave the way for the venture; environmental concerns are being ignored too.